Why BSNL mobile number verification required now and made it as mandatory? The question raised from many customers and also with many doubts. Here you may clear about all the queries. Towards national security and to find the genuineness of an individual customer, TSP (Telecom Service Provider) is re-verifying the Identity and BSNL mobile number address through EKYC with the Aadhar number. E-KYC full form is Electronic Know Your Customer, and it is an authentication process to verify the identity and address electronically. A person will continue to have their unique mobile number wherever he moves within India throughout his lifetime with this BSNL Mobile Number Reverification. Why should BSNL Mobile Number Verification be done with EKYC even after submitting Aadhar card when getting a new connection? Submitting Aadhar card physically means, there is an availability of documents, but the signatures of customer made even by any other third party also. But with this new BSNL mobile number address verification with EKYC, the original customer can be verified electronically with biometric fingerprints by uploading Aadhar data connecting with UIDAI. So there is also no chance for third party access. Why BSNL send the messages to link Aadhar Number? As per the orders of Honourable Supreme Court of India, every mobile number of all Telecom service providers (TSPs) should re-verify before 06.02.2018. It is also electronically by fetching the data from UIDAI. So mobile operator will send SMS to their existing customers to link Aadhar number by BSNL Mobile number verification. Can we link to the only Aadhar with biometric or any other proof also? Aadhar becomes mandatory because all TSP’s will fetch the data from UIDAI (Unique Identification Authority of India) only. Identity and Address are both available in one card, so there is no need of other proof verification for BSNL SIM card details. In some cases Father Name is not available in UIDAI data, that time customer has to submit other evidence in this BSNL mobile number verification to enter Father name in the database. How To Link Aadhar Card With BSNL Mobile Number & Process For Reverification? Approach any BSNL authorized retailer, franchisee or customer support center. Ask them to re-verify your existing BSNL mobile number by linking Aadhar. Immediately the retailer or the staff of BSNL will ask your mobile number and entered in their BSNL Swift App through their login in desktop or mobile. Immediately you will receive a four-digit PIN (personal identification number) to your working mobile number. Submit that PIN along with your Aadhar number to them. BSNL CSC staff or support employees will ask to put your thumb on their biometric device. Within seconds, your Aadhar data will fetch you on the screen of BSNL e-KYC App for re-verification. Support team will ask you to confirm the displayed address or BSNL SIM card details. After your final confirmation, they will ask again to put the biometric thumb impression on BSNL e-KYC App. It is for successful validation with UIDAI. With that, the total process will complete and issues a UIDAI Receipt number or application ID. All the verification details will reach through a message instantly. How to cancel the BSNL mobile number address verification which I have submitted. If any customer wants to cancel the BSNL mobile number verification, then have to follow this. A verification confirmation SMS will send to the client after 24 hours. The customer needs to respond within three days to complete the registration with response ‘REV YES’ or ‘REV NO’ to 53734. If no reply within time, it will be treated as YES, and Aadhaar registration is complete. 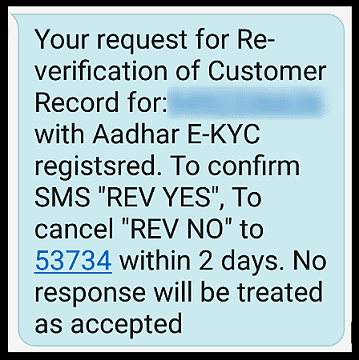 If the response received is ‘NO’ then re-verification is canceled, and the customer can do it afresh. BSNL mobile number address verification is allowed only two times in cases of dispute/discrepancy. How to know my Aadhar linked with the mobile number or not? If a customer wants to know the Aadhaar registration details, can send SMS ‘REV NAME’ to 53734. Therefore you will receive the details on reply SMS. What happened If I have not reverified or submitted Aadhar number with EKYC? It might be liable for disconnection of mobile services if the government didn’t extend the time for BSNL mobile number verification. Can the landline and broadband customers also link with Aadhar number? No, this verification hasn’t applied for landline or broadband services, so only mobile connections have to link Aadhar number with EKYC. This EKYC verification process is free for all customers. The operator will pay the several charges to their retailers to encourage EKYC Aadhar link. At present all the new connections are processing with BSNL E-KYC App only. So, there is no need to reverify again, the customers who miss verification with EKYC will have to present for BSNL Mobile Number verification. Can both Prepaid and Postpaid customers required verifying with Aadhar? Yes, all the customers of BSNL prepaid and postpaid services should submit their BSNL mobile number address verification. Is there any facility for BSNL mobile number verification through online. At present, there is no service to link Aadhar number for BSNL mobile number in online. Every customer must approach authorized retailer/franchisee or customer support center with Aadhar number for BSNL mobile number address verification to link that with biometric fingerprints. A customer belongs to once circle can reverify with EKYC in another circle? At present, every BSNL mobile number will have to reverify only in their parent circle only. Can this BSNL mobile number verification confirm two times in different locations? Once a customer verified by biometric fingerprints, BSNL EKYC App didn’t allow the client to reverify the mobile number again in any station. If you have more queries on this BSNL mobile number verification with Aadhar EKYC, please post us. If anything you can know beyond this, please share with all our readers.